Lawrence County, Pennsylvania is located in western Pennsylvania, along the border with Ohio. Our largest municipality is the City of New Castle, and it is located in the center of Lawrence County. New Castle is classified as a Micropolitan area, and in the 2018 Policom Economic Strength Ranking list, it was ranked the 251 strongest out of the 550 Micropolitan areas in the United States. The City of New Castle, by ground transportation is approximately 19 miles east of Youngstown, OH, 53 miles north of Pittsburgh, PA, 100 miles southeast of Cleveland, OH, 388 miles west of New York City, NY, and 428 miles east of Chicago, IL. Lawrence County provides multiple lifestyle choices ranging from New Castle’s urban area to rural Amish farms scattered along the northern reaches of the county. Lawrence County has 27 local governments and 8 independent school districts. Many of our school districts are well regarded, having recently been named to the top 10 performers on standardized test, as well as, winning a national blue ribbon. Besides being an outdoorsmen paradise with significant green spaces and rivers, Lawrence County is home to leading private employers, such as: UPMC Jameson Hospital, Westminster College, Liberty Mutual Insurance Company, Ellwood Group, Dairy Farmers of America, Infocision, Bruce & Merrilees Electric Co., McKesson Corporation, North American Dental Group, and several others. Lawrence County is a very diverse community with a lot to offer. With the median age at 43.6 years of age, nearly 70% in family households, and over 75% in owner-occupied housing, we offer your business a mature, stable and seasoned workforce. According to the 2010 Census, our county's population was 91,108 and was estimated in 2017 to be 87,069. Though the county is experiencing a generally declining population base due to migration out of the City of New Castle, rural and suburban areas of Lawrence County are seeing growth. Neshannock Township, for instance, saw a nearly 10% gain in population from the 2000 to 2010 census as a result of robust housing development activity. Click here for the latest Census Data Summary for Lawrence County. In 2006, it is estimated that 57.4% of Lawrence County’s residents were between the ages of 18 to 64. Our workforce’s median age in 2000 was 40.5 years old, with 70.4% of residents age 25 and older having a High School diploma and 9.4% of the same age group having a college bachelor degree or higher. Click here for the latest Lawrence County Profile from the Pennsylvania Department of Labor and Industry. Lawrence County is located at the core of North America’s largest concentration of population and business markets. Strategically positioned at the intersection of Interstate 80, a major East/West interstate system, and Interstate 79, a major North/South system, your business will enjoy easy access to such metropolitan epicenters as New York City, Chicago, Toronto and Atlanta. Lawrence County is the ideal location for businesses seeking access to the largest business and consumer markets in North America. If you are looking for a location to start, relocate or expand a business, you’re in the right place. Lawrence County is one of the most affordable markets in the state and in the U.S. Compared to the rest of the country, the City of New Castle's cost of living is 15% lower than the U.S. and Pennsylvania average according to the Council for Community and Economic Research Cost of Living Index and the cost of housing in New Castle is 58% lower than the national average! This tool provides a useful and reasonably accurate measure of living cost based on items carefully chosen to reflect the different categories of consumer expenditures. Weights assigned to relative costs are based on government survey data on expenditure patterns for professional and executive households. All items are priced in each place at a specified time and according to standardized specifications. Interpreting the index: Cost of Living Index measures relative price levels for consumer goods and services in participating areas. The average for all participating places, both metropolitan and non-metropolitan, equals 100, and each participant’s index is read as a percentage of the average for all places. Source: The New Castle, PA cost of living data displayed above is derived from the Council for Community and Economic Research (C2ER) for 2017. UPMC Jameson -- UPMC Jameson is a full-service community hospital serving the residents of Lawrence County and its surrounding communities. UPMC Jameson provides inpatient hospital care, surgical services, diagnostics, emergency medicine, senior care, rehabilitation, and a variety of specialized health care services. Formerly Jameson Health System, the hospital merged with UPMC on May 1, 2016. Since then, UPMC Jameson has been part of a world-class academic medical center that is consistently ranked in the prestigious U.S. News & World Report annual Honor Roll of America’s Best Hospitals. For more information on UPMC Jameson, click here. The Ellwood City Hospital -- First opened in 1913, today, the Ellwood City Hospital has progressed to a modern complex with a newly expanded emergency room, a 46-bed medical surgical unit with the capability of treating those patients with skilled nursing needs (i.e. swing beds), a 6-bed intensive coronary care unit, and a 10-bed geriatric psychiatry unit as well as a variety of diagnostic and surgical services. The Hospital offers a full spectrum of inpatient and outpatient care in surgical, laboratory, radiology, home health, physical and occupational therapy, nuclear medicine, cardiovascular and cardiopulmonary departments. Ellwood City Hospital's latest ventures include the Mary Evans Wound Care and Hyperbaric Center and a Laser Vein Clinic. Click here for more information on the Ellwood City Hospital. VA Butler's Lawrence County Outpatient Clinic -- Offers primary care to veterans, routine laboratory and outpatient behavioral health services. Each public body is lead by an elected school board that appoints a Superintendent. At present, Lawrence County's School Districts educate approximately 13,540 students throughout their 3 Pre-K Schools, 13 Elementary Schools, 5 Middle Schools, 10 High Schools, 1 Technical Center, and 5 Private School Programs. Housed in a 93,000 s.f. facility in Union Township, the New Castle School of Trades was founded in 1945 and has become a multipurpose technical and trade institution. The school is accredited by the Accrediting Commission of the National Association of Trade and Technical Schools (ACCSC), and in 1982, the school was approved by the Pennsylvania Department of Education to award the Associate in Specialized Technology Degree in the Electrical Technology program. The latest Associate in Specialized Technology Degree programs offered at the school are Automotive Technology, Machinist Technology, Motorcycle & Power Equipment Technology, Refrigeration & A/C Technology, Building Technology, Industrial Maintenance with Wind & Solar Technology, and Diesel & Heavy Equipment Repair Technology. Diploma programs are offered in: Combination Welding, Commercial Truck Driving, Construction Trades, Industrial Maintenance and Heavy Equipment Operations with Commercial Truck Driving. Click here for more information. Our highways provide us with unfettered access to both Interstates 80 and 680. Port of Pittsburgh -- Lawrence County nearest port services is the Port of Pittsburgh located on the Allegheny, Monongahela, and Ohio Rivers and is the largest tonnage port in Pennsylvania and the nation's third busiest port handling 34 million tons of cargo annually. It ranks as the 21st largest port in the United States and ranked 9th largest in the U.S. when measured in domestic trade. The Port of Pittsburgh marks the northeast end of the U.S. Inland Waterway System that stretches 9,000 miles through the heart of the nation to the Gulf of Mexico. The port is served by two major railroads and four interstate highways and is managed by the Port of Pittsburgh Commission. The Port of Pittsburgh District covers a 12-county area and over 200 miles of commercially navigable waterways within the State of Pennsylvania. A system of 17 locks and dams make the waterways navigable. The Port of Pittsburgh supports more than 200 public and private terminals and service suppliers. The Commission is a one-stop shipping link for port customers who need information about the river system and available services. Click here for more information. Port Erie -- The next closest water port to the Lawrence County market is Port Erie, Pennsylvania's only link to the Great Lakes-St. Lawrence Seaway system. The commercial and recreational port is positioned along a bay on Lake Erie's southeast coast. Located between New York and Chicago, the port is attractive for commercial shipping operations. Several touring companies operate from the port. Click here for more information. New Castle Municipal Airport -- This airport is owned and operated by the Lawrence County Airport Authority and located in Union Township, just a few minutes from downtown New Castle. The mission and scope of the airport is county-wide and offers two runways, one is 2,853 feet and the longest runway is approximately 4,000’, able to accommodate general aviation aircraft up to 65,000 lbs. The New Castle Municipal Airport is located on 350 acres in Union Township with access from Routes 224, and 422 and I-376. There are 46 T-hangars, 3 conventional hangars, and tie-down areas housing more than 65 aircraft. The passenger load for New Castle Airport is more 31,000 annually. Click here for more information. Pittsburgh International Airport -- Just a short 45 minute drive to the north is Pittsburgh International Airport with daily, non-stop service to more than 65 domestic and international airports. In May of 2018, the airport moved more than 840,000 passengers and over 13 million pounds of cargo. Cleveland Hopkins International Airport -- Just an hour and 40 miles from downtown New Castle, the Cleveland Airport is Ohio’s busiest airport, serving more than 9 million passengers annually. Cleveland airport offers daily, non-stop service to more than 53 domestic and international airports. In May of 2018, the airport moved more than 15 million pounds in cargo and nearly 860,000 passengers. Akron Canton Airport (CAK) -- In one hour and 30 minutes, air travelers can be at the smaller Akron-Canton airport that moves more 1.25 million passengers per year. American, Delta, Spirit and United all utilize CAK offering the lowest average airfare in the State of Ohio. Lawrence County is also blessed with rail as an option for your transportation needs. Two Class A rail carriers -- CSX and Norfolk-South -- serve Lawrence County as well one Class B carrier, the Buffalo & Pittsburgh ( operated by Genessee & Wyoming). All three are connected to an industrial short line service, New Castle Industrial Railroad. New Castle Industrial Railroad (NCIRR) -- Formed in 1991, the New Castle Industrial Railroad is a switching shortline serving industrial sites in and around New Castle, Pennsylvania. The operation utilizes industrial switching trackage left over from four Class 1 railroads that once served the area. Today, interchange is with CSX, Norfolk Southern, and the Buffalo & Pittsburgh -- a Genessee & Wyoming regional line terminating in New Castle. CSX Transportation (CSXT) -- The largest rail network in the eastern United States, CSXT is the core business unit of CSX Corporation. CSXT provides rail freight transportation over a network of more than 23,000 route miles in 23 states, the District of Columbia and two Canadian provinces. Their customers represent some of the state's largest industries, specializing in processed foods, phosphates and fertilizers, forest products and manufactured goods. Norfolk Southern Railway (NS) -- Norfolk Southern Railway is one of North America's larger Class I railroads and a subsidiary of Norfolk Southern Corp. The railroad operates 20,000 route miles in 22 states and the District of Columbia, serves every major container port in the eastern United States and connects with other rail carriers. Norfolk Southern also operates an extensive intermodal network and is a major transporter of coal and industrial products. Buffalo & Pittsburgh Railroad (BPRR) -- This 368-mile regional freight railroad interchanges with the Allegheny Valley Railroad, Canadian Pacific Railway, Canadian National, CSX Transportation, Nittany & Bald Eagle Railroad, Norfolk Southern, Rochester & Southern Railroad, and Western New York & Pennsylvania Railway. Their customers represent some of the state's largest industries, specializing in processed foods, phosphates and fertilizers, forest products and manufactured goods. Genesee & Wyoming (G&W) owns or leases 120 freight railroads worldwide that are organized in 11 operating regions with 7,700 employees and more than 2,500 customers. G&W’s nine North American regions serve 41 U.S. states and four Canadian provinces and include 113 short line and regional freight railroads with more than 13,000 track-miles. The County of Lawrence County real estate tax millage for 2018 is 7.309. The County has several taxing districts within its borders and each municipality charges an annual real tax and may also tax separately for Fire, Water, Light and/or Recreation. Total local real estate millage ranges from a total of 21.885 mills in Scott Township to over 58 mills in the City of New Castle. For more information about taxes in Lawrence County, Click here for 2018 Millage chart for Lawrence County municipalities. None of the municipalities within Lawrence County collect any additional local sales taxes, so the sales tax rate applicable to all locations is 6%, subject to the 6% Pennsylvania sales tax. The County of Lawrence and the Commonwealth of Pennsylvania do not levy or collect taxes on Personal Property. The City of New Castle levies a Business Privilege and a Mercantile based on the gross receipts of a business. All Municipalities and School Districts in Lawrence County levy an Earned Income Tax on all wages paid in their respective municipality ranging from .5% to 2.1% in the City of New Castle. Many also charge an annual flat-fee Local Services Tax ranging from $5 to $52 per employee. The Commonwealth of Pennsylvania, the County of Lawrence, and its municipalities are working hard to develop and sustain a business-friendly operating environment. State and local governments provide tax incentives, financing assistance and an array of services to help companies establish or expand in our Community. Below is a comprehensive list of offered programs at the local, regional and Commonwealth level. Please contact our office for more information! Local Economic Revitalization -- LERTA allows local government bodies to extend a tax-free period to businesses making improvements to real estate in a LERTA-designated area to encourage economic development and community growth. The County of Lawrence, the City of New Castle, and many of our Townships have customized LERTA programs to help your business. Click here to see LERTA details for participating municipalities. Educational Improvement Tax Credit Program (EITC) -- Tax credits to eligible businesses contributing to a Scholarship Organization, an Educational Improvement Organization, and/or a Pre-Kindergarten Scholarship Organization. Historic Preservation Tax Credit (HPTC) -- The Historic Preservation Tax Credit (HPTC) provides tax credits to qualified taxpayers who will be completing the restoration of a qualified historic structure into an income-producing property. All projects must include a qualified rehabilitation plan that is approved by the Pennsylvania Historical and Museum Commission (PHMC) as being consistent with the standards for rehabilitation. Entertainment Economic Enhancement Program (EEEP) -- Recipients of an Entertainment Economic Enhancement Program may use the tax credit to offset their Pennsylvania state liability or sell, assign, or transfer the credits to another entity. Film Tax Credit Program -- The Film Production Tax Credit Program is accepting applications for FY 2017-18. Overview Article Act 84 of 2016 (Article XVII-D, the Entertainment Production Tax Credit) authorizes the issuance of Film Production Tax Credits in an effort to expand Pennsylvania’s film industry. Job Creation Tax Credits (JCTC) Program -- JCTC offers a $1,000-per-job tax credit to create new jobs in the state within three years. Keystone Innovation Zone (KIZ) Tax Credit Program -- An incentive program that provides tax credits to for-profit companies less than eight years old operating within specific targeted industries within the boundaries of a Keystone Innovation Zone (KIZ). Manufacturing Tax Credit (MTC) Program -- Program provides tax credits to taxpayers who increase their annual taxable payroll by $1,000,000 through the creation of new full-time jobs. Neighborhood Assistance Program, Enterprise Zone Tax Credit (NAP/EZP) -- An incentive program that provides tax credits to businesses or private companies investing in rehabilitating, expanding, or improving buildings or land located within designated enterprise zones. Neighborhood Assistance Program (NAP) -- Tax credit program to encourage businesses to invest in projects, which improve distressed areas. Opportunity Scholarship Tax Credit Program (OSTC) -- The program provides tax credits to eligible businesses contributing to an Opportunity Scholarship Organization. Qualified Manufacturing Innovation & Reinvestment Deduction – Program was established to encourage increased investment and job creation through manufacturing in Pennsylvania. Research and Development (R&D) Tax Credit Assignment Program -- Allows companies holding qualifying Research and Development Tax Credits to apply for approval to sell those tax credits and assign them to the buyer(s). Video Game Production Tax Credit (VGPTC) -- Authorizes the issuance of Video Game Production Tax Credit to expand the video gaming production in Pennsylvania. Ben Franklin Technology Partners Challenge Grant -- Provides funds to businesses through the four Ben Franklin Technology Partners for access to capital, business expertise, technology commercialization services to advance the development of new technologies and for the generation, conservation, and transportation of alternative and clean energy. Building PA -- Provides mezzanine capital for developers for real estate assets in small to mid-sized Pennsylvania communities. Uses Real estate development in small to mid-sized PA communities. Eligibility Industrial Commercial and multi-use projects Funding Loan amount cannot exceed the amount of equity in the project. Business In Our Sites Grants/Loans -- Empowers communities to attract growing and expanding businesses by helping them build an inventory of ready sites. Business Opportunity Fund -- Installment loans, lines of credit and technical assistance for minority business enterprises, women-owned business enterprises and small businesses. Global Access Program (GAP) -- The Global Access Program (GAP) is designed to enhance the capability of small to mid-sized Pennsylvania companies to increase export sales. GAP is administered by the Pennsylvania Office of International Business Development (OIBD) and provides up to $5,000 per award period to qualifying Pennsylvania companies to reimburse up to 75% of eligible expenses associated with specific export promotion activities. The program is funded in part through a grant with the U.S. Small Business Administration. High Performance Building Program (HPB) -- The High Performance Building Program (HPB) provides financial assistance in the forms of grants and loan funds to underwrite the cost premiums associated with the design and construction or major renovation of high performance buildings in the state. Industrial Sites Reuse Program (ISRP) -- Grant and low-interest loan financing to perform environmental site assessment and remediation work at former industrial sites. Uses include Phase I, II and III environmental assessments; Remediation of hazardous substances Eligibility Public entities Private nonprofit economic development entities Companies involved in reuse of former industrial land Entities that did not cause or contribute to environmental contamination. Innovate in Pennsylvania: Venture Investment Program -- The Innovate in PA Venture Investment Program (VIP) is a Commonwealth of Pennsylvania initiative intended to address the financing needs of technology-oriented businesses by increasing the amount of risk capital available. The VIP operates pursuant to the statutory authority of the Ben Franklin Technology Development Authority (“BFTDA”). The goal of the VIP is to assist in establishing a technology-based economy within Pennsylvania, allowing Pennsylvania to compete in the global marketplace. Lawrence County Revolving Loan Fund and Lawrence County Enterprise Zone Revolving Loan Fund -- The LCEDC offers Revolving Loan Fund dollars for new and expanding businesses in Lawrence County for a number of uses including land and building purchase, construction and renovation, machinery and equipment, and other fixed asset lending needs. Marketing to Attract Business -- The Marketing to Attract Business Grant program is intended to support the promotion of business retention, expansion and attraction. More specifically, the program provides funding for projects that demonstrate the importance of marketing the state as a destination of choice for investment and promoting the attributes and assets of individual regions. Marketing to Attract Tourists - The Marketing to Attract Tourists Grant Program provides funding to support and development international tourism, sports marketing, outdoor recreation, and cultural attractions to non-profit organizations with a significant interest in the development of tourism. Multi-modal Transportation Fund – The Multi-modal Transportation Fund provides grants to encourage economic development and ensure that a safe and reliable system of transportation is available to the residents of the commonwealth. New PA Venture Capital Investment Program -- Loans to venture capital partnerships to invest in growth-stage PA companies. Next Generation Farmer Loan Program -- The Next Generation Farmer Loan Program uses federal tax-exempt financing to reduce a farmer’s interest rate for capital purchases, such as the purchase of farmland or agricultural machinery and equipment. Northwest Regional Planning and Development Commission Revolving Loan Fund -- This regional lender offers Revolving Loan Fund dollars for new and expanding businesses in Lawrence County for a number of uses including land and building purchase, construction and renovation, machinery and equipment, and other fixed asset lending needs. Pennsylvania Economic Development Financing Authority (PEDFA) Tax Exempt Bond Program -- Tax-exempt bonds, both in pooled transactions and stand-alone transactions, may be used to finance land, building, equipment, working capital and (in some cases) refinancing. Pennsylvania Economic Development Financing Authority (PEDFA) Taxable Bond Program -- Taxable bonds, both in pooled transactions and stand-alone transactions, may be used to finance land, building, equipment, working capital and refinancing. Pennsylvania First Program (PA First) -- Pennsylvania First (PA First) is a comprehensive funding tool to facilitate increased investment and job creation within the commonwealth. Pennsylvania Industrial Development Authority (PIDA) -- Pennsylvania Industrial Development Authority provides low-interest loans and lines of credit for eligible businesses that commit to creating and retaining full-time jobs and for the development of industrial parks and multi-tenant facilities. Pennsylvania Infrastructure Investment Authority (PennVEST) -- Low-interest loans for design, engineering and construction of publicly and privately owned drinking water distribution and treatment facilities, storm water conveyance and wastewater treatment and collection systems. Pennsylvania Minority Business Development Authority (PMBDA) -- PMBDA program provides low-interest loan to businesses owned and operated by ethnic minorities. Pipeline Investment Program (PIPE) -- The Pipeline Investment Program (PIPE) provides grants to construct the last few miles of natural gas distribution lines to business parks, existing manufacturing and industrial enterprises, which will result in the creation of new economic base jobs in the commonwealth while providing access to natural gas for residents. Pre-Apprentice and Apprenticeship Grant Program -- The Pre-Apprentice and Apprenticeship Grant Program (Apprenticeship Program) is a statewide program which offers assistance to registered apprenticeship programs. The program’s goal is to increase apprenticeship availability to Pennsylvania employers to assist them with their talent recruitment and development. Rail Freight Assistance (RFA) -- Grants to build or repair rail lines or spurs. Regional Investment Marketing (RIM) -- The RIM grant program is designed to support the marketing initiatives of regional alliances that adopt DCED’s industry-focused economic development model as part of a comprehensive business expansion and investment attraction initiative. Renewable Energy Program (REP) – Geothermal and Wind Projects -- The Renewable Energy Program (REP) provides financial assistance in the forms of grant and loan funds to promote the use of alternative energy in Pennsylvania. Small Diverse Business Capital Access Program (SDBCA) -- The Small Diverse Business Capital Access Program is administered by the Pennsylvania Industrial Development Authority (PIDA) and provides low-interest loans and lines of credit to small diverse businesses that commit to creating and retaining full-time jobs within the Commonwealth. Solar Energy Program (SEP) -- The Solar Energy Program (SEP) provides financial assistance in the form of grant and loan funds to promote the use of solar energy in Pennsylvania. USDA Rural Micro-Entrepreneurial Assistance Program -- The LCEDC administers USDA RMAP Revolving Loan Fund dollars for new and expanding businesses in Lawrence County for the purchase of machinery and equipment to businesses with ten or fewer full-time employees. WEDnetPA -- The program provides qualified employers training funds for new and existing employees. 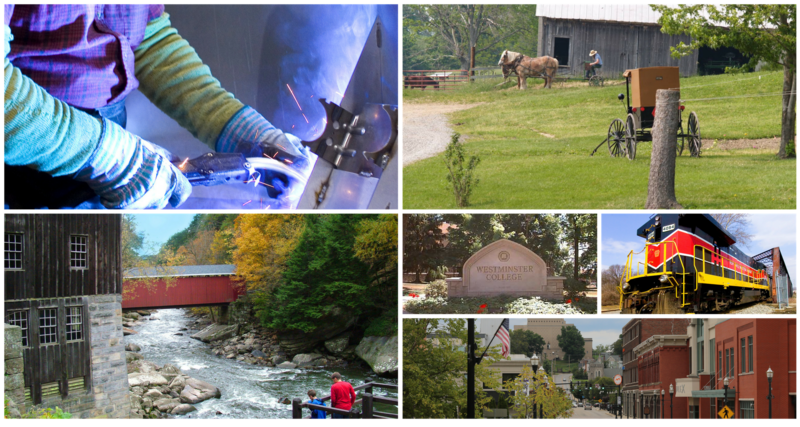 First Industries Fund (FIF) -- The First Industries Fund (FIF) is a program aimed at strengthening Pennsylvania’s agriculture and tourism industries through loan guarantees. New Pennsylvania Venture Guarantee Program -- Guarantees to top-tier venture capital partnerships for investments in growth stage Pennsylvania companies. Pennsylvania Capital Access Program (PennCAP) -- Loan guarantee through participating banks to be used to support a wide variety of business purposes. Tax Increment Financing (TIF) Guarantee Program -- Promotes and stimulates the general economic welfare of various regions and communities in the Commonwealth and assists in the development, redevelopment and revitalization of Brownfield and Greenfield sites in accordance with the TIF Act. Second Stage Loan Program -- Loan Guarantees for working capital for 2-7 year old manufacturing, biotech and technology-oriented companies. Powdered Metals Program -- The Powdered Metals Program provides training programs for the existing workforce supported through Penn State and the regional community education councils. PA Life Science Greenhouse Initiative -- The Life Sciences Greenhouses are models of effectiveness and efficiency. They capture the innovation potential of the life sciences industry and nurture that potential with critical early-stage funding and sector-specific business expertise. Pennsylvania Infrastructure Technology Alliance (PITA) -- PITA is a collaboration of the Commonwealth of Pennsylvania, the Center for Advanced Technology for Large Structural Systems (ATLSS) at Lehigh University, and the Institute for Complex Engineered Systems at Carnegie Mellon University. Pennsylvania Manufacturing – Industrial Resource Center Program -- The Pennsylvania Manufacturing – Industrial Resource Center (IRC) program helps manufacturers compete more effectively through the adoption of modern manufacturing philosophies, techniques, and technologies. The program supports a network of Centers that serve as resources for technology implementation in every region of the Commonwealth and serves the state’s small and medium-sized manufacturing industries. Pennsylvania Manufacturing Innovation Program (PMIP) -- The Pennsylvania Manufacturing Innovation Program (PMIP) leverages the internationally acclaimed science and engineering talent and discovery capacity of all Pennsylvania’s institutions of higher education to help ensure that Pennsylvania remains a national and international leader in manufacturing and achieves the full economic potential for good well-paying manufacturing jobs. Pennsylvania Manufacturing Training-to-Career Grant Program -- The Pennsylvania Manufacturing Training-to-Career Grant program will not duplicate existing programs such as WEDNet and Next Generation Industry Partnerships but is designed to help companies identify and train a skilled workforce while creating a workplace culture that allows the workforce to advance and the company to grow and compete in a competitive, global economy.